When I look at a map of Europe there are a number of places I have not been, but none stand out quite like Spain. I really can’t say why I never made there. Spain definitely has its charms, historical relevance, big cities, and a cuisine worthy of attention, yet somehow it was never on my radar. That is until a few months ago when I began pondering my Autumn 2013 destination. So I decided this would be the year I would explore the Spanish cities of Barcelona and Madrid. Like I said, I started to float the idea a few months ago. It began with my typical pattern of researching flights, hotels, and attractions, but one thing I didn’t plan for was having a companion along for the journey. As a solo traveler, I have become accustomed to going it alone. My friends here have lives that prevent the kind of travel I am fortunate to do. Be it work, college, or family, most of them just don’t have the ability to tag along with me. Well this changed in a big way when my friend Alex assured me he was joining this trip. 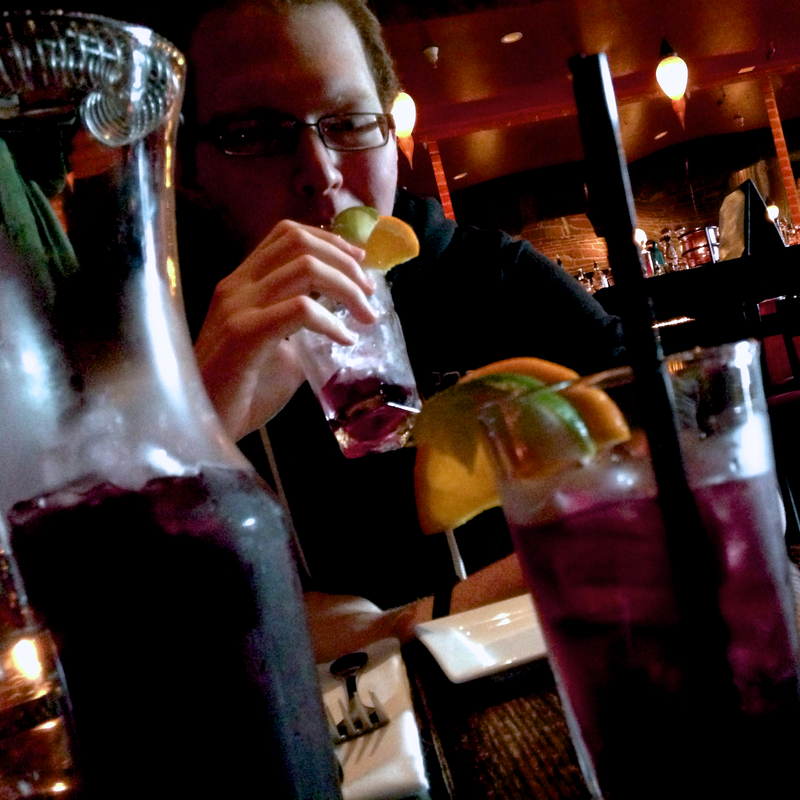 Alex and I celebrate our booking over tapas and sangria in Denver. Now to say I’m not a little nervous at the idea would be a lie. We are great friends, but my penchant to go off trail and avoid scripting could prove to be a struggle for any travel companion. So, before we booked anything, we talked and researched. I shared my stories from past trips and my philosophy. Luckily, he is easy going and agreed to much of it. Aslo, I have one other aspect of this trip I am excited about, I have a friend who lives in Barcelona. David will be a huge asset that I have not been afforded in the past. A local’s perspective is always a bonus. I am certain we will be able to find and do things with far less effort by having him show us around. In the early stages of planning I discovered the only thing I wasn’t pleased about with traveling to Spain, the cost. Yep, Spain is a bit pricey. I searched and delayed, I even went beyond my rule of booking 6 months early. The flights are just going to cost more when flying from Denver to Spain, I just had to accept it. Our plan is to fly from Denver to Barcelona and return via Madrid to Denver. When I first started to search the prices were about $1250 each (I know, yikes…my entire flight and hotel package to Istanbul was only $1420), but after a few weeks they dipped to $1145 and stayed there for a few weeks. Since it is now only 4 months away, I finally got the itch and we decided to just book our tickets before they jumped back up. One important detail Alex and I had to discuss was the sleeping arrangement. We might be close friends, but we both want space. Two hotel rooms would be a little exorbitant for us, and the idea of a twin or double room didn’t appeal either. This is where we decided to book an apartment through Airbnb (a site that provides an avenue for homeowners to rent out an empty guest room, apartment, or entire home to travelers). Airbnb has a good structure for reviews with pictures of both hosts and their property. That provided for some confidence even though the concept is quite foreign to us. We must have spent weeks looking at different apartments before we finally settled on a Barcelona and a Madrid location we could agree on. In the end, I believe what we booked will make for fantastic stays in both cities. Our place in Barcelona is a high floor 2 bedroom apartment with a massive patio that affords an amazing view of nearly the entire city. Our cost for this apartment is $960. In Madrid it seems everything was less expensive. We found a nice 2 bedroom place in the heart of the Grand Via neighborhood for $445. Both of these locations will give us the space and location we desire. Alex and I couldn’t be more excited. The final part of the trip still to be booked is the train from Barcelona to Madrid. The tickets can’t be bought this early, but I already know they will be about $120-140 each depending on the exchange rate at the time of purchase. With the train tickets included, that brings our total cost for transportation and lodging in Spain to $3960 (roughly $1980 each). Ouch, I told you Spain was pricey. All I can say is that I’ll take the bargains when I can, but this one definitely would have been much more expensive without Airbnb. So now the long months of anticipation and planning begin. I can’t wait to explore the Gaudí structures of Barcelona, browse the Picasso museum, and photograph the many plazas of Madrid. This should be an incredible trip. This will also be the first trip I won’t see alone! Capital Pride in Washington D.C. Hitting the road for discovery and exploration. Visiting the land of vikings! My first trip to Spain. Excited to explore the architecture and artistic history of this great country.